There are certainly plenty of contrasting elements in the home, which Osorio designed with interior design firm Casa do Passadiço. 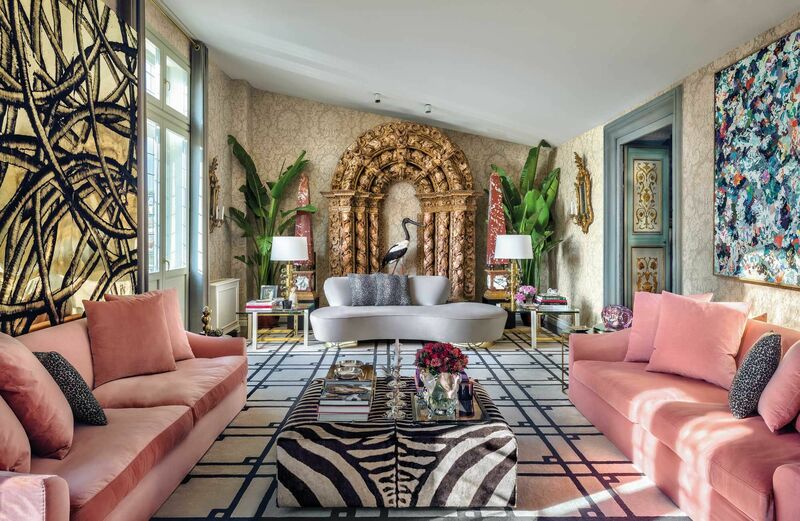 The damask gold and cork wallpaper in the living room is matched with a carpet in a geometric pattern, while blush-pink sofas from Meridiani flank a pouf covered in zebra print. Potted plants with large fronds and a decorative crane leaven the mix. Overlooking all this are artworks by Aaron Young, Dan Res and Douglas Gordon, while a baroque-style Portuguese altar from the 17th century is a striking feature of one of the walls. Full of colour and character, the room looks sumptuous but not intimidating—a place to relax and have fun. Another foyer area in the home, the entrance, offers a different vibe, with the walls covered in exquisite De Gournay wallpaper featuring a flowering tree and birds on a pretty blue background, as Osorio wanted the area to resemble a winter garden.